A little while ago, my boyfriend and I were at Santa Monica Place. As we were walking around, we passed M.A.K.E., Matthew Kenney’s raw (or “living foods”), plant-based restaurant. We had been meaning to try it sometime, so my boyfriend surprised me and said, “let’s go.” I was excited. I had heard such great things about the menu, and couldn’t wait to try the food for myself. I ordered the raw lasagna (pictured above) and it was absolutely delicious. 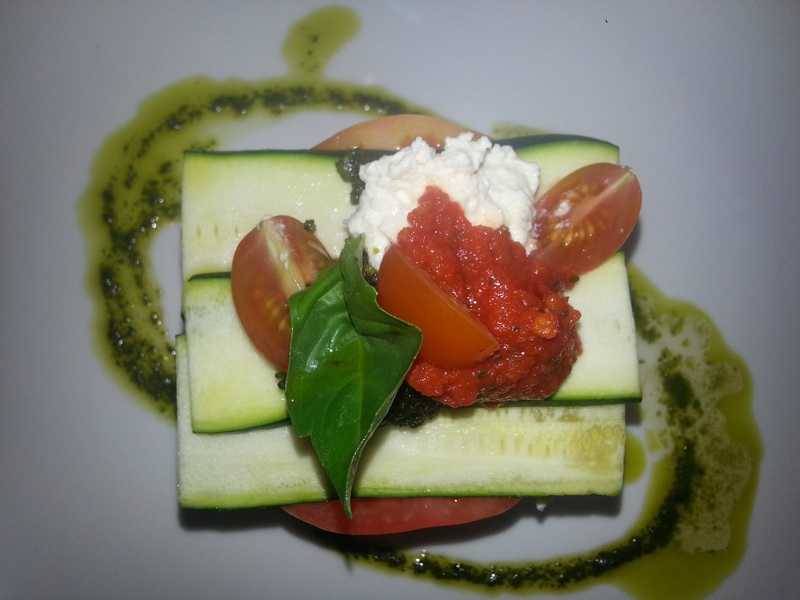 The “cheese” is made out of macadamia nuts and the lasagna is piled high with raw zucchini, tomatoes, and a yummy pesto made out of pistachios and basil. The lasagna is definitely the best thing we had (I didn’t take a picture of my boyfriend’s meal, and even though it was tasty, I enjoyed the lasagna more). We also ordered a couple of drinks; I tried the malted chai smoothie and loved it! I would definitely get it again – the flavors work amazingly well together and it’s rich and creamy – so good! My boyfriend, Tim, ordered the heartbeat cocktail, because he loves blood orange. It was good, but I’m not much of a drinker, so I’ll probably try a new smoothie next time, or order my beloved malted chai. All in all, it was a great experience with fresh, delicious food. The server was helpful and I would say that M.A.K.E. is worth trying at least once, if not more. I’ve since noticed that they have a happy hour menu, which is available Monday – Thursday, from 4 to 6PM. You can order reasonably priced drinks, snacks, and dessert during happy hour. Additionally, the restaurant is right next to Matthew Kenney Culinary, so if you’re feeling really fancy, you can take classes and learn how to make these delicious dishes for yourself! The fact that this restaurant is in Santa Monica is another plus, because it’s in Santa Place Place; you can go shopping, get something to eat, and then head to the beach. I can’t wait to go back and maybe I’ll see you there!